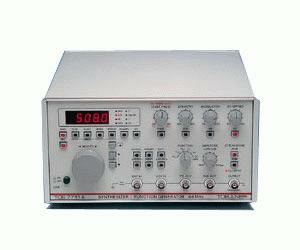 The Toellner TOE 7402 and TOE 7404 function generators are compact, rugged and low-cost signal sources designed to meet everyday practical requirements. The outstanding feature of these instruments is the frequency counter with LED for measuring both internal and external signal frequencies. The high output voltage of max. Vpp = 30 V will satisfy the requirements of most general-purpose laboratory or service tasks as well as the needs of applications in production plants or educational institutions. All inputs and outputs are absolutely no-load and short-circuit proof. The output amplifiers are guarded against dangerous feedback by an integral external voltage protection feature. These generators have a frequency range of 0.5 Hz to 5 MHz and generate the following output functions: sine, triangle, square, pulse, amplifier and bipolar DC voltage. When in amplifier mode, the instruments perform as a broadband amplifier from DC up to approx. 5 MHz. Frequency error: ± 2 digits.